Time-to-hire is one of the most important and frequently used hiring and recruiting metrics. Time-to-hire metric measures how quickly a company can select and hire the best candidate. In this blog post, you will learn how to calculate time-to-hire (formula included!) and discover the most effective ways to reduce your company’s time-to-hire! Time-to-hire is one of the key recruiting and hiring metrics. Time-to-hire shares the pedestal with cost-per-hire and quality-of-hire. These 3 metrics are the most important and most frequently used recruitment metrics. Time-to-hire metric measure s how quickly a company can select and hire the best candidate. It will tell you how many days your HR team needs to fill your open job position. Time-to-hire is often used as a synonym for time-to-fill. This is a mistake! 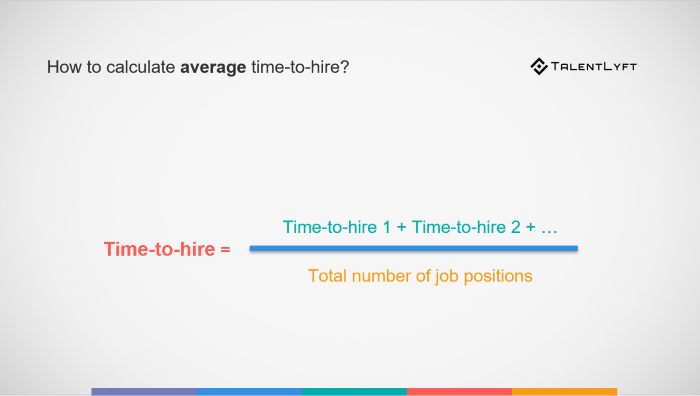 Time-to-hire-and time-to-fill are two completely different metrics. Time-to-fill counts the days from the date when you’ve published your new job opening. The date when a hiring request is submitted for approval or the date when approval is given to start filling a position may be used instead of the date when the open position is published. Time-to-hire counts the days from the date when the candidate has entered your pipeline. In other words, a starting point for measuring time-to-hire is when you have your candidate (applied or sourced). Time-to-fill answers the question: How long is your whole recruitment process, from creating a new job opening to hiring someone? 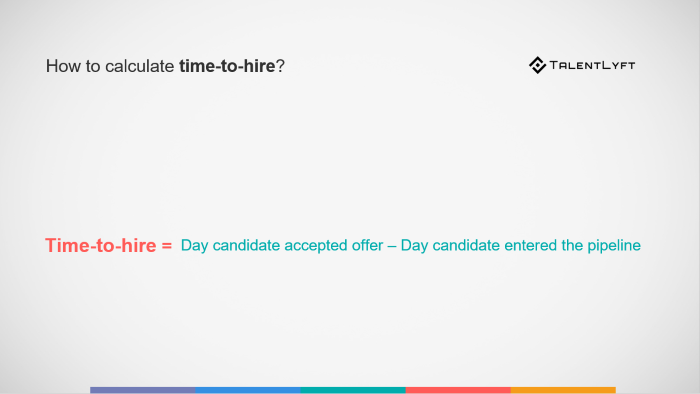 Time-to-hire answers the question: After you have candidates (sourced or applied) for a job opening, how many days does it take to hire someone? Time-to-fill will tell you how many days you need to fill a position once you’ve defined the need for hiring a new employee. Thus, this metric is very useful for planning your hiring needs. Time-to-hire will tell you how quickly you can select the best candidate once you have a pipeline of suitable candidates. Thus, this metric is very useful for validating the efficiency of your selection process. Although these two metrics may seem similar at first, you shouldn’t use them interchangeably. 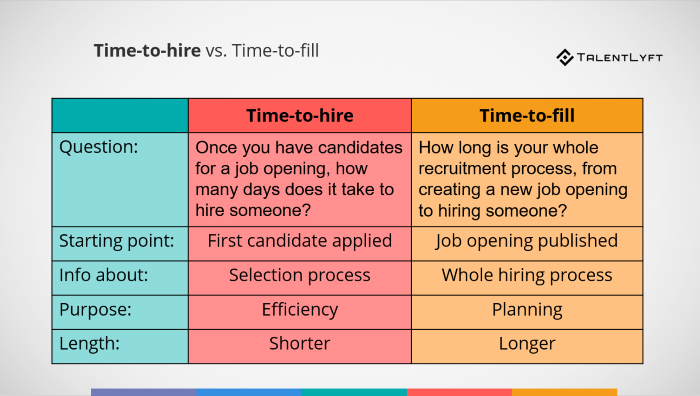 Time-to-fill is always longer than time-to-hire because it measures the time needed to get approval for hiring a new employee, publishing and advertising your new open job position and the time needed for the first candidate to apply. Time-to-hire is the number of days passed since a candidate entered your pipeline until the day you hire a new employee. You can also calculate your average time-to-hire. For example, let’s say you had 3 job openings in the last month. How to calculate your average time-to-hire? Simply add time-to-hire for your first, second and third open job position and divide the sum by the total number of job openings (in this case, 3). You can calculate an average time-to-hire for a certain department, location, etc. during different time periods, such as a month, quarter. year, etc. What is the average time-to-hire? A recent survey conducted by Spark Hire for their 2018 Growth Hiring Trends Report surveyed 500 talent acquisition professionals in the United States. They found that for 49% of the survey respondents, 7 to 14 days from receipt of an application to offer letter was the norm; 24% of companies reported that it takes them 15 to 30 days to make a hire. According to LinkedIn, only 30% of companies are able to fill a vacant role within 30 days. The other 70% of companies take anywhere between 1 - 4 months to process a new hire. The Society of Human Resource Management (SHRM) 2017 Talent Acquisition Benchmarking Report has found that the average time-to-fill a position is 36 days. Note that some of these reports use time-to-hire as a metric and other time-to-fill. It is also important to highlight that an average time to hire can differ regarding different industries and specific roles, departments, cities, countries, cities etc. Why is it important to measure time-to-hire? Time-to-hire is one of the top 3 most important hiring and recruitment metrics. According to LinkedIn’s research, time-to-hire is a so-called “north star” metric, the second metric they use to measure their hiring success. Why is time-to-hire so important? Time-to-hire is an excellent metric to evaluate the efficiency of your selection process. A long time-to-hire raises the cost of your hiring, but it can also cause you to lose top candidates. 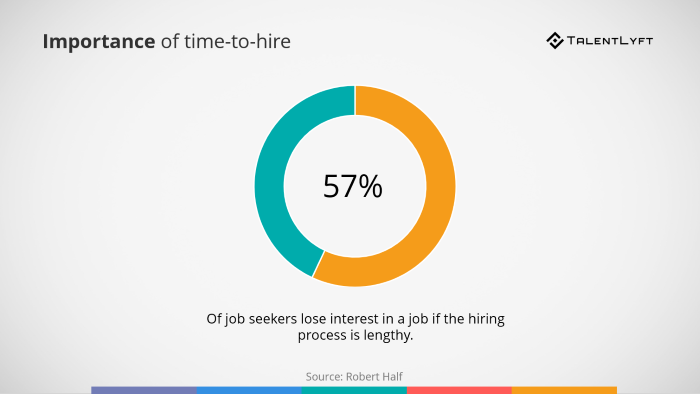 Robert Half's research has found that a whopping 57% of job seekers lose interest in a job if the hiring process is lengthy. Thus, reducing time to hire is a great way to reduce your cost-per-hire and improve your candidate experience. One of the best ways to reduce your time-to-hire is to use modern recruitment software. 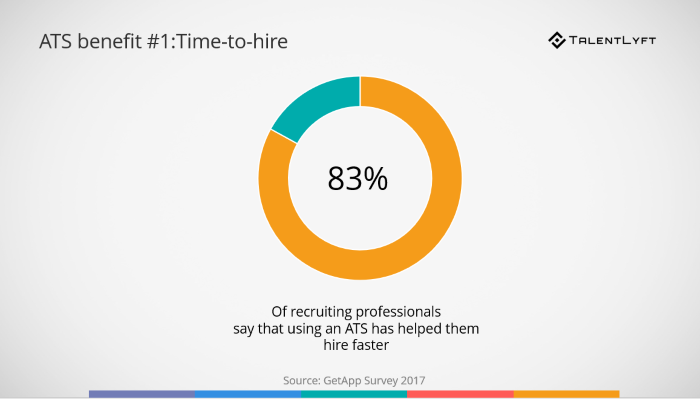 According to research, 86% of recruiting professionals say that using an ATS has helped them hire faster. Modern recruitment software has many benefits and different features which enable companies to significantly reduce their time-to-hire. Modern recruitment software will automatically track and measure your time-to-hire. That way you can get an insight into how long does it take to hire for a particular job opening and make changes accordingly. For example, you can notice that a certain stage of your selection process takes too long and find solutions to resolve such bottlenecks. Modern recruitment software has ready-to-use recruiting email templates you can personalize and send in bulk. That way, you can save a lot of time and ensure that you communicate with every candidate on time with a personalized message. With a modern recruitment software, you can send automated emails with an interview appointment that automatically sink with your work calendar. That way you’ll save valuable time going back and forth to arrange a suitable time slot for all your candidates. With a modern recruitment tool, you can automatically screen application forms and eliminate candidates who are not qualified. That way, you’ll be able to quickly and efficiently eliminate unsuitable candidates at the start of your selection process and save time you would otherwise waste on them. Bonus idea for reducing your time-to-hire: Conduct group interviews! Implement an employee referral program.